Having searched the globe for the finest porcelain, ceramic, marble and glass-makers, David Hunt Lighting’s Alchemist Collection invokes the spirit of travel and exploration, while complementing the company’s proud Cotswold heritage. 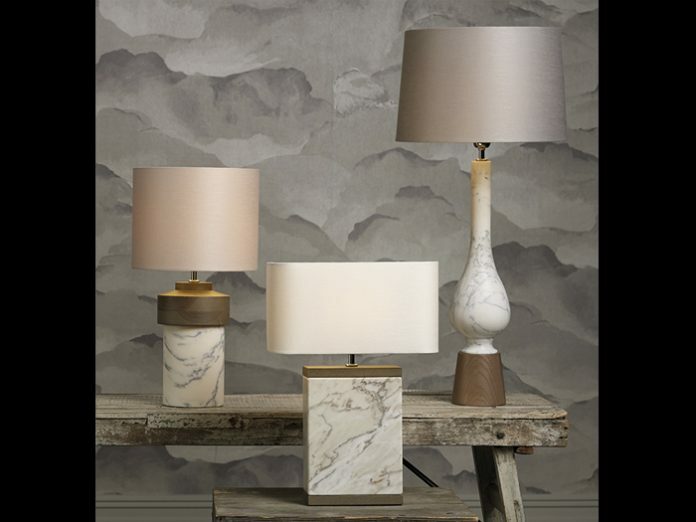 Headlining the new additions to the collection are the Nomad, Inca and Apache table lamps crafted from Portuguese Pele de Tigre marble with blue-grey veining. The Lustre table lamp is crafted from an oil-glazed ceramic and the gloss ribbed ceramic Tidal table lamp boasts a beautiful depth of colour, available in Petrol Blue or Taupe. The gloss-white ceramic Vaughn is available in two sizes and the mouthblown glass Vienna table lamps are available in a choice of two glass colourways – clear and rosebud pink – both paired with antique brass metalwork. Also, among The Alchemist Collection’s new designs are the head-turning Evora and the Boavista, which features antique brass metalwork and a braided cable. Both table lamps are crafted from textured Volcanic effect glass in either gold or silver colourways.